J W Pepper & Son, Inc. The greatest reward of a music educator is to see kids loving music and feeling a sense of accomplishment and camaraderie. The planning, the work, the intense rehearsal, all the extra time and effort; everything it takes for a teacher to invest in the process – it’s all worth it when the students are successful and express joy for the journey. This is how I ended this year of teaching. It was a year of rebuilding. The school’s choral program had struggled and waned but the parish wanted the choir up and running for the performing arts academy to begin successfully this coming fall. It was a privilege for me to get to be the one who took on that challenge. It was exhilarating to see students who were in a high school choir for the first time becoming successful in part-singing and enjoy making music as an ensemble. After ten years away from the choral setting, this was a venture well worth the return to the classroom. Since my career spans over forty years I’ve gained a serious perspective of how important music is in the life of the young; how important it is for instruction in music to be available to students regardless of their chosen career path in life. Most students will move into various fields of employment outside formal music education. But they won’t forget the benefits of being a part of a music ensemble with their peers. When weighed in the balance, it’s all about the legacy for the love of music that we instill in our students. As this school year ends and a new school year waits close at hand, I look forward to another opportunity to enjoy the teaching and learning process. Thankful to be a part of the future . . .
LMEA continues to add a new generation of music educators to our Board of Directors. We are excited to have their enthusiasm and ideas enhancing our operations and discussions. Go to the lmeamusic.org homepage to view upcoming events scheduled by LMEA for the 2017-2018 school year. A full calendar of events will be developed during the summer months. 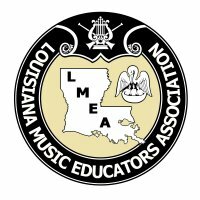 The calendar, plus event details, will be updated, expanded, and periodically posted to the LMEA website during June, July, and August. Stay in contact with your LMEA District Director for your local calendar of events. I also want to give credit where credit is due. We have a tremendous Board of Directors in place. Each of them has made important contributions to LMEA. The "new blood" added to the Board over the past few years has had a tremendous impact. Likewise, Board veterans keep LMEA viable with new ideas and the stability that comes with many years of experience. Thanks to Bruce Lambert and Fran Hebert for decades of tremendous leadership and influence. Thanks to Division Chairmen who have brought innovations and upgrades in so many ways. Thanks to Sharon McNamara-Horne who has led a digital re-invention of LMEA through the website. Thanks to all the District Directors who continue to make music education work at the grass-roots level. Conductors for the 2017 LMEA All-State Choirs will be Dr. Andre Thomas from Florida State University for the Concert Mixed Choir and Ms. Angie Rawls from Pearl River, Mississippi, for the Women’s Choir. First round audition will be “Heilig” by Mendelssohn – 8 part –Walton Edition (W2163). The second round audition piece will be “To Thee Cherubim and Seraphim” by Handel - SSATB–edited by Alex Favazza. Hinshaw Music – HMC2530. Conductors for the 2017 LMEA All-State Bands will be Gary Green, the University of Miami (Retired), for the Symphonic Band and Alfred Watkins, Bands of America Hall of Fame, for the Concert Band. Conductor for the 2017 LMEA All-State Orchestra will be Robert Gillespie, from The Ohio State University. Deadline for submission of All-State Orchestra (String) audition recordings is September 28, 2017. Conductor for the 2017 LMEA All-State Jazz Ensemble will be Wycliff Gordan, world-renowned jazz trombonist, arranger, composer, band leader and music educator. Deadline for submission of All-State Orchestra Jazz audition recordings is September 28, 2017. Featured Clinicians for the 2017 LMEA Professional Development Conference will include Sandy Knudson, Artistic Director of the Norman (Oklahoma) Children's Chorus and Lamar Alexander (Sponsored by LAKE), internationally-acclaimed Kodaly music educator.